I was in the Los Angeles area Sunday, heading up the 405, past the smokey, smoldering hillsides of Calabasas and deep into the San Fernando Valley when I heard the news that comic book kingpin Stan Lee had passed away. I was in a shuttle bus with a half-dozen international journalists when — as cell phones starting pinging — our spidey senses started tingling. In an instant, the set visit we were heading to (embargoed and, hence, undisclosed for now) seemed less important than the news at hand. After the set visit, I made my way down to Hollywood Boulevard and found Lee’s star on the Hollywood Walk of Fame. It is in a rather inglorious place, on the south side of the street and well west of the Chinese Theatre, Kimmel’s studio and most major landmarks. Still, it was easy to find (on the sidewalk in front of 7082 Sunset), as fans had already started to gather. Flowers were places on the star as well as framed photos and other mementos. A large wreath stood head tall on a stand. 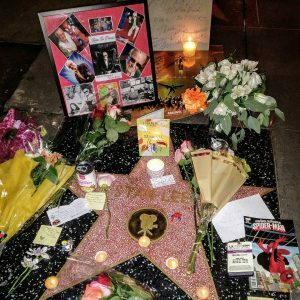 A film crew was there and a gentleman in a Spider-Man T-shirt was paying tribute to Lee. You can watch some of his remarks in the video, above. Lee appeared before TV critics at one or two TCA press tours over the years. He always looked like he’d just hit the jackpot in Vegas and in a way he had, creating a universe of super heroes that so dominates the blockbuster entertainment scene today that on the brand new Air Canada 737 Max 8 I flew down on, passengers could choose from a menu made up entirely of Marvel feature films. As a youngster growing up, I enjoyed the comic books but was never a fanatical collector. Lee’s copy was smart and snappy, with all those, “‘Nuff said” and “comin’ ‘atcha” catch phrases, but I marveled more at the drawings, especially those inked by prolific Jack Kirby as well as Carmine Infantino for DC. That artist made The Flash move standing still, made the Submariner look Spockian before Spock. I have not seen most of the Marvel movies of the past 15 years, although the first Iron Man was pretty cool. More fun — and a good way to skip hours of mind-numbing, computer generated special effects excesses — is to follow this link to the best part of most of these movies: Stan Lee’s star-making cameos. The man knew how to play himself. 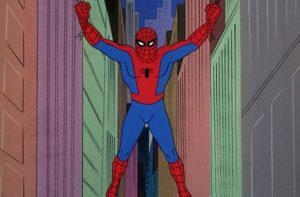 My view of the whole Spider-Man movie franchise is probably skewered by the original, barely animated TV series from the late ’60s, Spider-Man. 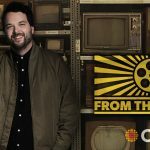 Despite an astoundingly low-budget that saw producers stoop to re-using scenes from the even less animated Rocket Robin Hood series, the show had a few things going for it: Lee’s writing (plucked from the comic books) and the talented cast of Canadian radio and TV actors who voiced the characters. Paul Soles was front and centre as the voice of Peter Parker/Spider-Man. The Stratford-trained Soles, 88, told me earlier this year that he still gets asked more about his fleeting Spider-Man fame then just about anything else he’s ever done, save perhaps his voice work on TV’s original Rudolph the Red-nosed Reindeer. I like to think that Lee would have laughed at that lyric — right before he called his lawyer. I can’t ever recall Carmine Infantino drawing the Sub-Mariner. Certainly not before Star Trek. Only artists I can think of who drew Namor before 1966 were Kirby in FF & Avengers, Wally Wood in Daredevil, and Gene Colan under a pseudonym in Tales To Astonish. I may have Infantino mixed up Pat, was going on memory, which gets foggier by the minute.